Shannen is one of our 2017-18 educational ambassadors; she teaches in Wuyi Hushan Experimental Primary School in Zhejiang Province. I want to share this experience with you. How did a Midwesterner from the USA learn to live and teach in a small town in the province of Zhejiang, China? Before I delve into this, I would like to thank AYC for allowing me to embark on this journey of Chinese culture and education. AYC placed me at Wuyi Hushan Primary School. This school is known as the oldest primary school in the Zhejiang province, with more than 100 years of existence as an institution. The school moved to a completely new school building, so I arrived in good timing. The funny thing is that the library finished by the time I finished, and many classrooms are still being decorated. Even though Hushan excelled at subjects such as math and science, English was a different story. The level of English at this school was beginner to intermediate, so I knew that I would be in for a challenge. Luckily, I had the best English group of teachers who always collaborated with me to help teach these students. Do know that some of the teachers may not speak great oral English, so please have patience. Many of the students were such avid learners of English, and even though I couldn’t speak much Chinese, they still enjoyed the fact that I was their foreign teacher. I taught Grades 3-6, and I also had my own class every Wednesday called “Happy Class”. I believe that one of the best parts of this experience was creating my own material to teach. I shared many aspects of American culture and education, but the students also exchanged their culture with me such as inviting me to their homes or watching their performances. At the end of the program, some students gave me their Chinese calligraphy writings as gifts. A piece of advice: communication is key with your school administration and coordinator. If there is miscommunication, you can always reach out to AYC. They are very willing to help you out! There may be some minor bumps along the way, especially if Chinese isn’t your first language. Chinese education opened my eyes to how learning and studying is super important at a young age, yet I also witnessed how it may be detrimental to their health. Keep an open mind, stay positive, and truly appreciate how hardworking these students are throughout your time with AYC. I lived in Wuyi, Zhejiang. Wuyi, also known as 山清水秀, is famous for its clean air, mountains, and hot springs. The town is small, yet they have a high-speed train station stop. I practically biked everywhere using the public bike system. This town is developing rapidly, but I still felt a strong sense of traditional China compared to the bigger cities such as Shanghai and Beijing. For example, people still wash their clothes in the river on sunny days, and squatting is still the most popular method of going to the toilet. I’ll be honest. Culture shock occurred during the first two months of my time in Wuyi, but I had to embrace it. Nevertheless, the shock subsided because of Wuyi people. I have never met such kind and generous people in my 25 years of living. If I ever felt a tinge of homesickness, my new Chinese friends would notice this. They would take me to their grandparents’ homes for a meal or go out for milk tea. The little things mattered, and it led to such a humbling experience. Also, I’d like to give a shout out to Leslie, another AYC ambassador who lived in Wuyi as well. Even though we taught at different schools, I am forever grateful for our weekly din-dins just to keep our sanity. The best part of all during my time with AYC was the decision to live with a Chinese family. How did this happen? Two things: WeChat and Yoyo. If you don’t have the WeChat app, download it now. Almost everyone in China uses WeChat to communicate with each other. Before I came to China, I used WeChat almost every day communicating with Yoyo, the school coordinator of Wuyi Hushan Primary School. 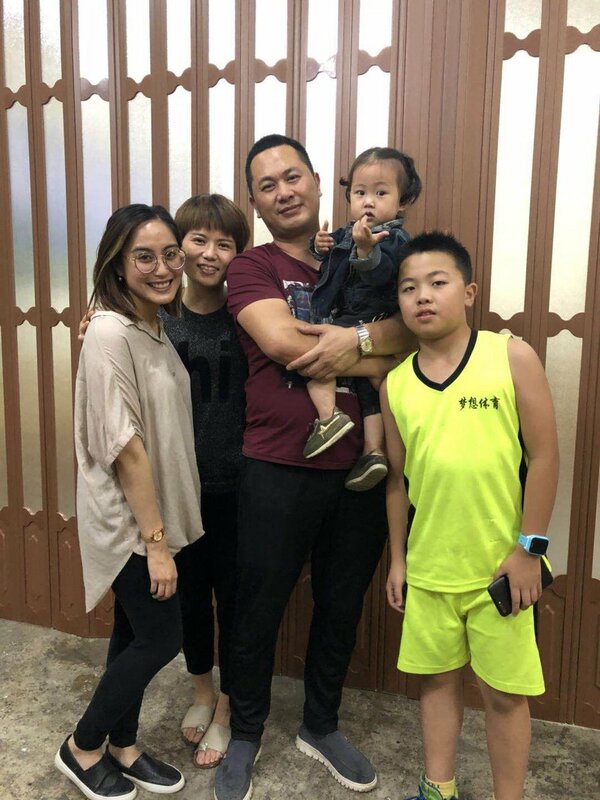 During that time, I began to learn about Yoyo’s life as a teacher and mother of a ten-year-old boy and a one-year old baby girl. Also, she did an internship in America before, so we both felt a similar feeling about cultural exchange. Once I arrived in Wuyi, within the first two weeks, I knew I wanted to live with Yoyo. Her family was what helped me through the culture shock and homesickness. First, her children brought me so much joy whether it was being greeted by her baby girl in the mornings or watching her son win a football game. Second, her extended family welcomed me with open arms and invited me to outings and dinner. Lastly, it was Yoyo’s friendship that encouraged me to learn so much more about myself and what I wanted out of this experience. I couldn’t have been any luckier and blessed to be matched with her. So, what happens after all of this? Well, I am continuing my journey in China as a foreign teacher. I believe that my experience with AYC has helped me find a bigger purpose, and that I should further involve myself in Chinese education. For those who will begin this program this fall, maybe you know what you’re doing after, but keep your eyes open for opportunities. I can say that this experience was once in a lifetime, so please take advantage of every single moment. I know I did! Good luck future AYC ambassadors!